Salicylic acid (SA) is a key defense signal molecule against biotrophic pathogens in plants. Quantification of SA levels in plants is critical for dissecting the SA-mediated immune response. Although HPLC and GC/MS are routinely used to determine SA concentrations, they are expensive and time-consuming. We recently described a rapid method for a bacterial biosensor Acinetobacter sp. ADPWH_lux-based SA quantification, which enables high-throughput analysis. In this study we describe an improved method for fast sample preparation, and present a high-throughput strategy for isolation of SA metabolic mutants. On the basis of the previously described biosensor-based method, we simplified the tissue collection and the SA extraction procedure. Leaf discs were collected and boiled in Luria-Bertani (LB), and then the released SA was measured with the biosensor. The time-consuming steps of weighing samples, grinding tissues and centrifugation were avoided. The direct boiling protocol detected similar differences in SA levels among pathogen-infected wild-type, npr1 (nonexpressor of pathogenesis-related genes), and sid2 (SA induction-deficient) plants as did the previously described biosensor-based method and an HPLC-based approach, demonstrating the efficacy of the protocol presented here. We adapted this protocol to a high-throughput format and identified six npr1 suppressors that accumulated lower levels of SA than npr1 upon pathogen infection. Two of the suppressors were found to be allelic to the previously identified eds5 mutant. The other four are more susceptible than npr1 to the bacterial pathogen Pseudomonas syringae pv. maculicola ES4326 and their identity merits further investigation. The rapid SA extraction method by direct boiling of leaf discs further reduced the cost and time required for the biosensor Acinetobacter sp. ADPWH_lux-based SA estimation, and allowed the screening for npr1 suppressors that accumulated less SA than npr1 after pathogen infection in a high-throughput manner. The highly efficacious SA estimation protocol can be applied in genetic screen for SA metabolic mutants and characterization of enzymes involved in SA metabolism. The mutants isolated in this study may help identify new components in the SA-related signaling pathways. Salicylic acid (SA) is a key signaling molecule in plant defense against biotrophic pathogens [1, 2]. Upon pathogen attack, SA accumulates in plant cells [3, 4]. Prevention of SA accumulation leads to disease susceptibility , whereas treatment with SA confers resistance to a variety of biotrophic pathogens [6, 7]. Thus, understanding the mechanisms underlying SA accumulation is critical in the study of plant immunity. Nawrath and Métraux  performed a genetic screen for Arabidopsis mutants that do not accumulate SA after pathogen infection and identified two genetic loci, SID1/EDS5 and SID2/EDS16, which were later shown to encode a chloroplast MATE (multidrug and toxin extrusion) transporter  and an SA biosynthetic enzyme ICS1 (isochorismate synthase) , respectively. In the screen, Nawrath and Métraux used an HPLC-based method to quantify the SA levels in the pathogen-infected leaf tissues from about 4,500 individual M2 plants. Because the HPLC-based method involves extraction of SA in organic solvents, evaporation of organic solvents, chromatographic purification and detection by fluorescence spectroscopy [11, 12], it is extremely costly and time-consuming. To screen for more SA metabolic mutants, a much faster and less expensive method is needed. Huang et al. recently developed an SA biosensor, named Acinetobacter sp. ADPWH_lux . This strain is derived from Acinetobacter sp. ADP1, and contains a chromosomal integration of a salicylate-inducible luxCDABE operon. The operon encodes a luciferase (LuxA and LuxB) and the enzymes that produce its substrate (LuxC, LuxD and LuxE) so cells that express the cluster emit the 490-nm light spontaneously . The biosensor is highly specific to SA, methyl-SA, and the synthetic SA derivative acetylsalicylic acid , thus suitable for the quantification of SA from crude plant extracts. We previously described an approach for the simultaneous quantification of free and glucose conjugated SA from Arabidopsis leaf extracts using Acinetobacter sp. ADPWH_lux . Here we present a further shortened protocol for the estimation of SA levels in pathogen-infected leaf tissue. Using the protocol described, we have performed a genetic screen for suppressors of the npr1 (nonexpressor of pathogenesis-related genes) mutant that hyperaccumulates SA during pathogen infection [16, 17]. The method we previously described comprises leaf tissue collection (weighing samples), grinding, extraction in LB or acetate buffer, and centrifugation . The resulting crude leaf extract is then mixed with a culture of the SA biosensor in a 96-well cell culture plate, and incubated at 37°C for one hour. The luminescence is then determined. Compared with the conventional HPLC or GC/MS method [11, 18], the biosensor-based method is much faster and requires little tissue (as few as 2-3 leaves) . However, the tissue collection (especially weighing samples) and the extraction procedure are still time-consuming. To search for an even faster method, we collected leaf discs (0.7 cm in diameter, omitting weighing the samples) with a hole punch from the bacterial pathogen Pseudomonas syringae pv. maculicola (Psm) ES4326-infected leaves of wild-type Col-0, npr1 and sid2 plants. We used pathogen-infected Col-0, npr1 and sid2 plants as samples because they contain significantly different levels of SA [8, 17]. Each leaf disc was placed in 200 μL of LB in a 1.5-mL eppendorf tube, and boiled at 95°C for 20 minutes. The LB extracts were cooled down to room temperature, and then mixed with the SA biosensor and incubated at 37°C for one hour. The luminescence was then determined. We found that SA was readily extracted by the direct boiling of leaf discs. As shown in Figure 1A, the pathogen-infected Col-0 and npr1 samples had significantly higher luminescence than uninfected samples, whereas the sid2 samples just had background luminescence regardless of whether they were infected or not. 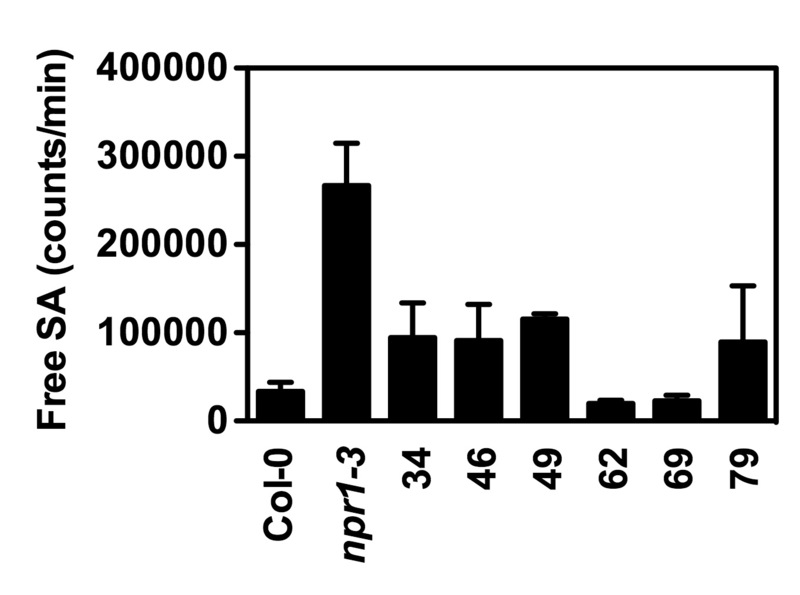 Furthermore, the luminescence emitted by the infected npr1 samples was significantly stronger than that emitted by the infected Col-0 samples (Figure 1A). The differences among Col-0, npr1 and sid2 were very similar to those revealed by the previously described biosensor-based method and the HPLC-based approach (Figures 1B and 1C). These results suggest that the direct boiling method is able to detect the differences in SA levels among different genotypes, thus suitable for genetic screens for mutants with altered SA levels. The direct boiling method in comparison with the previously described biosensor- and HPLC-based methods. (A) Luminescence from Psm ES4326-infected Col-0, npr1 and sid2 detected by the direct boiling method. (B) Luminescence from Psm ES4326-infected Col-0, npr1 and sid2 detected by the previously described biosensor-based method. (C) Free SA levels in Psm ES4326-infected Col-0, npr1 and sid2 detected by the HPLC-based method. Values are the mean of 8 samples (A), 6 samples read in triplicate (B), and 4 samples (C) with standard deviation. We adapted the direct boiling protocol to a high-throughput format competent for genetic screens. The strategy is schematically described in Figure 2A and a detailed protocol is presented in Additional file 1. Again, we used Col-0, npr1 and sid2 to test the efficacy of the strategy. Seedlings of Col-0, npr1 or sid2 were transplanted into one third (32 pots) of a 96-pot tray (Figure 2B). Three weeks later, half of the plants of each genotype were inoculated with Psm ES4326 (Figure 2B). To save the time spent on inoculation, only one leaf on each plant was inoculated. Twenty-four hours later, a leaf disc from each inoculated leaf was collected using a hole punch, and placed into 200 μL of LB in a corresponding well of a 96-well PCR plate. After all 96 leaf discs (from the 96 plants in Figure 2B) were collected and placed into the 96 wells, the PCR plate was put in a PCR machine and heated at 95°C for 20 minutes. The extracts were cooled down to room temperature, and 50 μL of each extract was added into a corresponding well in a black 96-well culture plate loaded with 50 μL of a freshly prepared biosensor culture in each well. After incubation at 37°C for 1 hour in the dark, luminescence was assayed using a microplate luminometer. As shown in Figure 2C, the differences in SA levels among the three genotypes were clearly detected using the "96-pot tray/96-well PCR plate/96-well culture plate" format. High-throughput strategy for isolation of SA metabolic mutants. (A) Schematic of the "96-pot tray/96-well PCR plate/96-well culture plate" screen strategy. (B) Col-0, npr1 and sid2 plants grown in a 96-cell tray treated with or without Psm ES4326. (C) Luminescence from the Col-0, npr1 and sid2 plants in (B) treated with or without Psm ES4326. We then attempted to set up a mutant screen aimed at identifying new components involved in regulating SA accumulation. 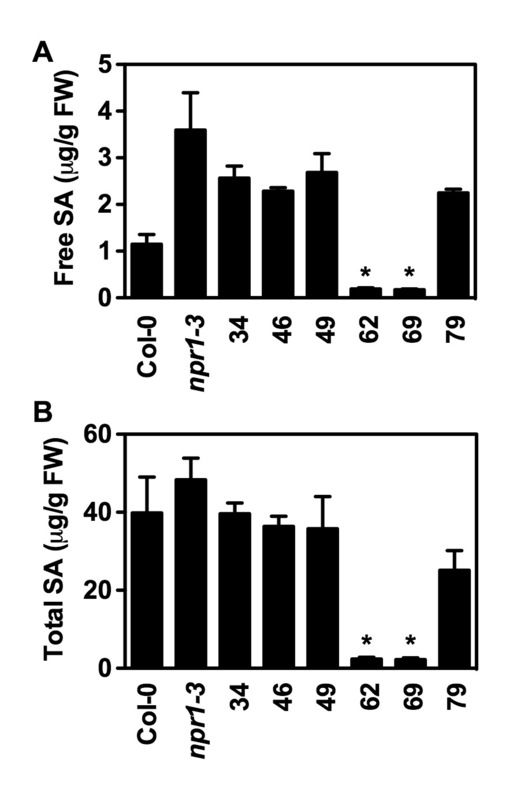 Since the npr1 mutant accumulates significantly higher levels of SA than wild type during pathogen infection, and NPR1 is a key positive regulator of SA-mediated immune responses [19–21], we reasoned that npr1 suppressors, which accumulate less pathogen-induced SA than npr1, would help uncover important regulators of plant immunity. We therefore decided to use the npr1 mutant as starting material for the screen. One gram of npr1 seeds were treated with ethyl methanesulfonate (EMS) and sown on soil. M2 seeds were collected in pools when the M1 plants matured. After germination, M2 seedlings were transplanted into 96-pot trays and screened as described in Figure 2A. So far, approximately 10,000 M2 plants have been screened. 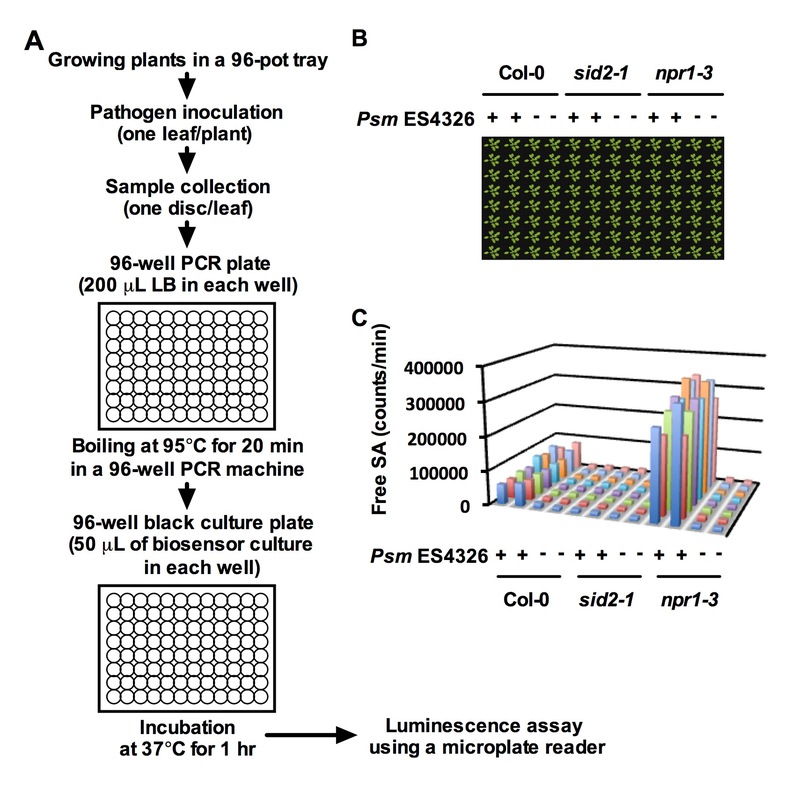 Figure 3 shows the luminescence from the plants in a randomly selected tray in the primary screen. The primary screen has identified 35 putative npr1 suppressors. Luminescence from a randomly picked tray of plants in the primary screen. Luminescence from Psm ES4326-infected M2 plants was determined using the direct boiling method in a "96-pot tray/96-well PCR plate/96-well culture plate" format. Arrows indicate the putative npr1 suppressors. The putative suppressors were re-screened using the direct boiling protocol. In the secondary screen, three M3 plants from each putative suppressor were assayed. 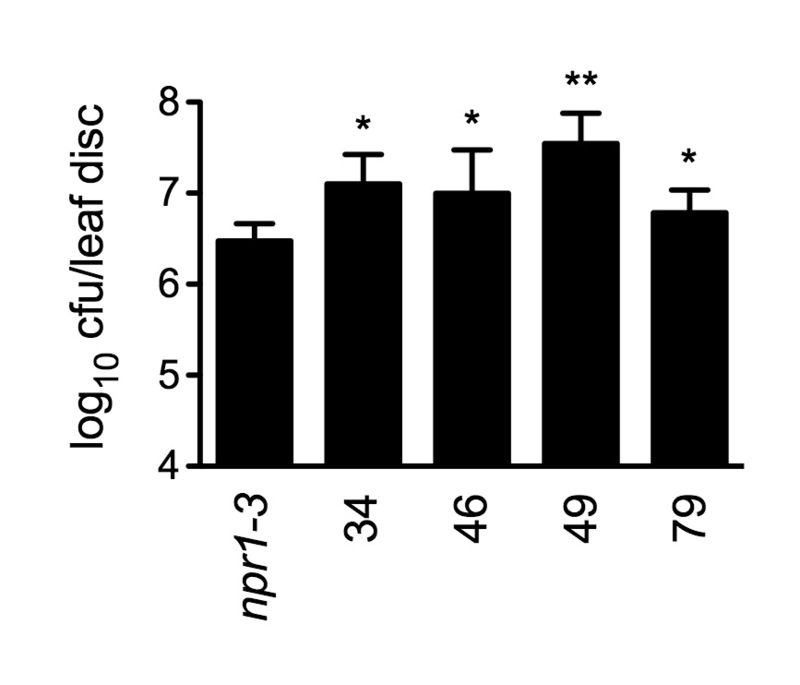 As shown in Figure 4, six putative suppressors had lower luminescence than npr1. Luminescence from six putative npr1 suppressors in the secondary screen. Luminescence from Psm ES4326-infected M3 plants of six putative npr1 suppressors was determined using the direct boiling method. To further confirm that the suppressors accumulate less SA than npr1 after pathogen infection, we measured SA levels in the suppressors using HPLC. 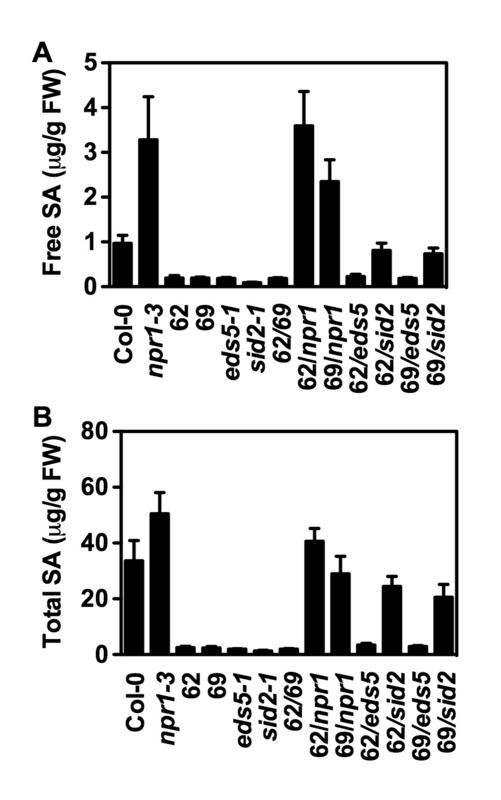 As shown in Figure 5, after Psm ES4326 infection, all six suppressors accumulated lower levels of both free and total SA than npr1, suggesting that the suppressors contain mutations that modified the SA accumulation pathway in npr1. Interestingly, suppressors 62 and 69 accumulated very low levels of SA, similar to the previously characterized eds5 and sid2 mutant. To further characterize these two suppressors, we measured Psm ES4326-induced SA levels in the F1 plants of the following crosses: 62 × 69, 62 × npr1, 69 × npr1, 62 × eds5, 62 × sid2, 69 × eds5, and 69 × sid2. 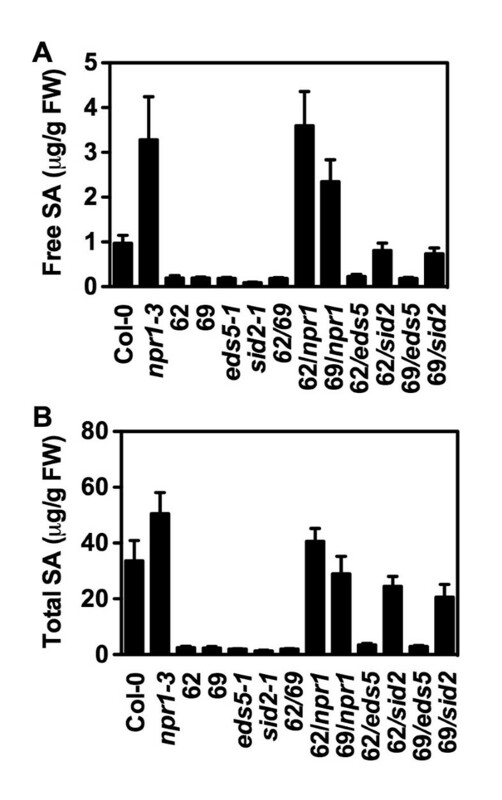 As shown in Figure 6, after Psm ES4326 infection, the F1 plants of 62 × 69 accumulated similar levels of SA as 62 and 69, whereas the F1 plants of 62 × npr1 and 69 × npr1 had similar amounts of SA as npr1, suggesting that 62 and 69 are allelic and contain a recessive mutation, since the 62 and 69 alleles will be heterozygous in the F1 Plants. Furthermore, the F1 plants of 62 × eds5 and 69 × eds5 accumulated similar levels of SA as eds5, whereas the F1 plants of 62 × sid2 and 69 × sid2 had similar amounts of SA as wild type, indicating that suppressors 62 and 69 are alleles of the eds5 mutant. SA levels accumulated in the npr1 suppressors determined by HPLC. Free (A) and total (B) SA levels in Psm ES4326-infected npr1 suppressors were assayed using the HPLC-based method. Values are the mean of 4 samples with standard deviation. The experiment was repeated with similar results. The suppressors 62 and 69 accumulated significantly less SA than npr1 (*P < 0.0001). SA levels accumulated in the F 1 plants determined by HPLC. Free (A) and total (B) SA levels in Psm ES4326-infected F1 plants of different crosses among 62, 69, npr1, eds5, and sid2 were assayed using the HPLC-based method. Values are the mean of 4 samples with standard deviation. The experiment was repeated with similar results. To identify the genetic mutations in 62 and 69, the open reading frames of the two alleles of EDS5 were sequenced. The allele 62 carries a transition mutation converting a TGG to a premature stop condon (TGA) at nucleotide 753 of the coding region, whereas the 69 mutation is caused by a G-to-A transition in the AG from the splice acceptor site in intron 5, which may lead to an abnormal splicing at the border of intron 5/exon 6. These results indicate that the mutant screen identified two new alleles of the previously isolated eds5 mutants . To test whether the genetic mutations in the SA metabolic mutants affect pathogen resistance, we inoculated npr1-3 and the four mutants, 34, 46, 49, and 79, with the bacterial pathogen Psm ES4326. The eds5 alleles, 62 and 69, were excluded since eds5 has been well characterized . The in planta growth of Psm ES4326 was monitored three days after inoculation. As shown in Figure 7, Psm ES4326 grew significantly more in the SA metabolic mutants than in npr1-3. The growth of Psm ES4326 in 49 was 10-fold higher than in npr1-3. This result is significant since npr1-3 is already highly susceptible to Psm ES4326 , demonstrating that the high-throughput method developed in this study is valuable in identifying new components in the SA-mediated defense signaling pathway. Pathogen growth in the SA metabolic mutants. Leaves of 4-week-old plants were inoculated with Psm ES4326 (OD600 = 0.0001). The in planta bacterial titers were determined 3 days postinoculation. Cfu, colony-forming units. Data represent the mean of 8 independent samples with standard deviation. Psm ES4326 grew significantly more in 34, 46, 49, and 79 than in npr1-3 (*P < 0.05, **P < 0.002). The experiment was repeated three times with similar results. Here we present a direct boiling protocol for the rapid estimation of SA from plant tissue using the SA biosensor Acinetobacter sp. ADPWH_lux. This protocol is much faster and less expensive than the previously described biosensor-based approaches [13, 15]. The fast sample preparation procedure, which comprises inoculation of one leaf on each plant, collection of leaf discs, and boiling in LB, significantly reduced the time spent on inoculation, tissue collection, grinding and centrifugation. This method was not designed to accurately determine the SA concentration. Rather, it is intended to estimate SA levels for rapid genetic screens with significant reductions in cost and processing time. We acknowledge that SA levels induced by Psm ES4326 infection can vary quite a lot among individuals of the same genotype, depending on plant growth conditions. Additionally, this method may not be sensitive enough in some applications, such as time-course quantifications of SA levels with pathogen infection. However, the successful genetic screen for suppressors of the npr1 mutant has demonstrated the efficacy of this high-throughput strategy. We hope that the methodology presented in this study can help saturate the genetic screens for SA metabolic mutants, which in turn will facilitate a more thorough understanding of this important plant defense molecule [22, 23]. The wild type used was the Arabidopsis thaliana (L.) Heynh. Columbia (Col-0) ecotype, and the mutant alleles used were npr1-3 , eds5-1  and sid2-1 . EMS mutagenesis was performed as described in . Briefly, one gram of npr1-3 seeds were placed in 25 mL of 0.2% EMS (v/v) in a 50-mL Falcon tube and incubated on a rocking platform for 15 hours. After the seeds were washed eight times with water, they were suspended in 0.1% agarose and sown on soil. M2 seeds were collected in pools when the M1 plants reached to maturity. The M2 plants were germinated, transplanted to 96-pot trays, and then grown at 22~25°C under a 16 hr light/8 hr dark regime for three weeks. Infection of plants with Psm ES4326 was performed as described previously . One leaf on each plant was infiltrated with a suspension of Psm ES4326 (OD600 = 0.001). Twenty-four hours after Psm ES4326 infection, a leaf disc was collected from each infected plant using a hole punch and placed in 200 μl of LB in a well of a 96-well PCR plate. The plate was then heated at 95°C for 20 min in a PCR machine and cooled down to room temperature. An overnight culture of Acinetobacter sp. ADPWH_lux was diluted in 37°C LB (1:20) and grown for ~2 hrs at 200 rpm to an OD600 of 0.4. Using a multipipette, 50 μl of biosensor culture was added to each well in a 96-well black cell culture plate, and then 50 μl of the crude extract was added to each well and mixed by pipette action. The plate was incubated at 37°C for 1 hr without shaking before luminescence was read using a Veritas™ Microplate Luminometer (Promega Corporation, Sunnyvale, CA). Measurement of SA with HPLC was done as described by Verberne et al. . Briefly, ~0.1 g tissues were ground in liquid nitrogen and extracted with 1 mL of 90% methanol. After centrifugation at 14,000 g for 10 min, the supernatant was transferred into a microcentrifuge tube. The pellet was extracted with 0.5 mL of 100% methanol and the supernatant was transferred to the same tube and dried in a speed vacuum to final volume of ~50 μL. The residue was resuspended to 500 μL with hydrolysis buffer (0.1 M sodium acetate buffer, pH 5.5). The mixture was equally split into two microcentrifuge tubes [one for free SA, the other for glucose conjugated SA (salicylic acid 2-O-β-D-glucoside or SAG)]. For SAG, 10 units of β-glucosidase were added to the tube. After incubation at 37°C for 1.5 hr, an equal volume of 10% TCA was added to both tubes. After centrifugation at 14,000 g for 10 min, the supernatant was transferred to a fresh tube and partitioned with 1 mL extraction solvent (1 ethylacetate: 1 cyclohexane). The top organic phase was transferred to a new tube, and dried in a speed vacuum to final volume ~25 μL. The residue was resuspended to 0.25 mL with 0.2 M sodium acetate buffer (pH 5.5). After centrifugation at 14,000 g for 10 min, the supernatant was used for HPLC analysis. The sample was eluted with 0.2 M sodium acetate buffer pH 5.5 in 10% methanol at a flow-rate of 0.80 mL/min. All statistical analyses were performed with the data analysis tools (t-TEST: Two Samples Assuming Unequal Variances) in Microsoft Excel of Microsoft Office 2004 for Macintosh. George Marek, Ryan Carver contributed equally to this work. We thank Dr. Hui Wang (NERC/Centre for Ecology and Hydrology-Oxford, Oxford, UK) for the SA biosensor strain Acinetobacter sp. ADPWH_lux, and Drs. William Gurley and Sixue Chen (University of Florida, FL) for access to the Veritas™ Microplate Luminometer and the HPLC equipment, respectively. This work was supported by a grant from the Herman Frasch Foundation for Chemical Research and a grant from the National Science Foundation (IOS-0842716) awarded to Z.M., and publication of this article was funded in part by the University of Florida Open-Access Publishing Fund. GM, RC, YD, DS, and XZ performed the experiments. ZM designed the project, wrote the manuscript, and is the PI of the laboratory. All authors read and approved the final manuscript.